Located in the much sought after Crystal Beach subdivision, this magnificent Destin Florida home awaits you to fulfill all of your vacation desires. With over 3300 square feet of living space and not one detail overlooked you will feel like you have stepped out of REALITY and into your dream vacation home. 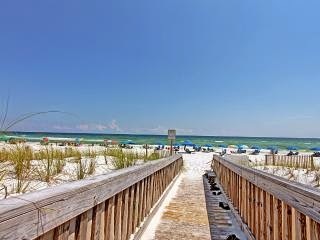 Just over a block to the magnificent sugar white sand beaches where you can spend a lazy day basking in the sun or playing in the Emerald Coast green waters of the Gulf of Mexico. Alternatively you can lounge around your private 26X13 ft swimming pool and play or simply catch up on your reading on one of the many balconies that this home boasts. You can also jump in your car and within minutes be at Big Kahuna's water park, Gulfarium or one of the many first class golf courses that Destin offers. Within walking distance to restaurants, shopping and the brand new Destin Commons with the new Rave movie theatre complete with stadium seating. This home is truly a place that you will want to return to year after year after! Whether you are a large family or several families this home can accommodate all.